On the first day of school, Emma Emmets surveys her classmates and sees plenty of shared interests, crushes not being acted upon, and people too afraid of cooties to know what they're missing. Emma tries her hand at uniting lonely Leah and nerdy Otto . . . and a matchmaker is born. After successfully matching bullies, dorks, athletes, and weirdos, she's ready for her most high-profile client yet: Isla, a fourth grader so popular she hangs out with the fifth graders. But when Emma's efforts go terribly awry, she finds herself with a powerful new enemy. Suddenly life on the playground is horribly wrong. With all her classmates blissfully paired off, Emma's left with no one! Is the matchmaker destined to be alone? 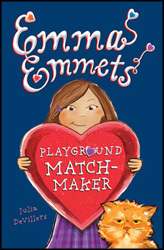 Emma Emmets hopes to make a name for herself in fourth grade, and on the first day of school, she discovers a talent she didn't know she had: matchmaking. When she paired up two friends to be leapfrog partners at day camp over the summer, she unknowingly created a perfect couple, Annie and Henry, who sing Emma's praises. Though that first match was a fluke, Emma quickly decides to launch EmMatchmaking from atop the new school jungle gym. After giving it some thought and creating a few quizzes, Emma discovers she does indeed have a flair for making matches "that... made people happier. Slowmances! Friendships! Whatever!" Though challenges arise, such as finding a match for her rival Isla and run-ins with new student Daniel, Emma comes out on top. With lively characters, a realistic portrayal of school life, and a main character with sharp observations and a natural effervescence, DeVillers's (the Liberty Porter, First Daughter series) story should be a winning match for readers just starting to think about crushes, boyfriends, and dates. Ages 7-12.